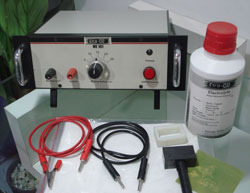 Electro-Chemical etching systems are perfect for marking various conductive metals. Metallic Items can all be marked through Consumables like Stencils and Electrolyte Solution. Using metal etching technique we are capable of marking high quality logos, simple text messages, part numbers, dates, serial numbers and other required information, directly onto the psroduct - whether the surface is rounded or flat. The marking process takes a matter of seconds.